Superglue works wonders for everyday projects, but it seems far less magical when you accidentally get it all over your fingers or household surfaces. Keep a bottle of acetone (in the form of nail polish remover) handy, and you can easily remedy any crafting misapplications. Known for its impressive strength and ultra-quick dry time, superglue plays a vital role in many household fixes. 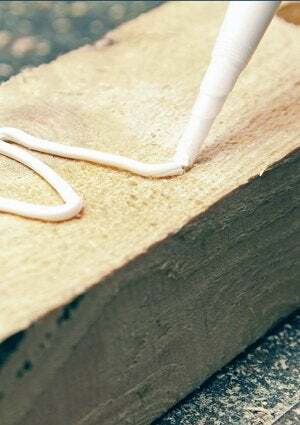 But, often when applied to variety of crafts, woodworking projects, and everyday repairs, its swift bonding properties have a nasty habit of unintentionally gluing things together—like your fingers, for instance. Because this fast-acting adhesive—known by several brand names, including Super Glue, Gorilla Glue, Krazy Glue, and Loctite—is impervious to water, it’s often not worth attempting the standard solution of soap and H2O to remedy mishaps. Instead, try battling superglue with its one nemesis: acetone. This natural solvent, a primary ingredient in most nail polish removers, can work wonders, helping to remove the glue from your hands, clothes, and countertops. Note: Straight acetone can remove color from some fabrics and may cloud some surfaces, so use with caution and always test a small area first before you begin. 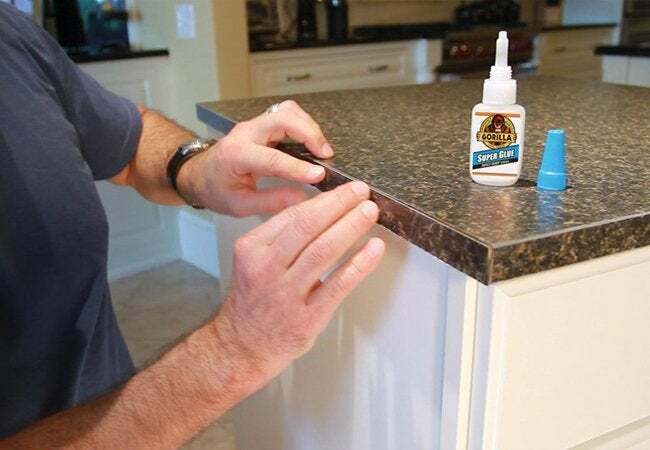 Superglue is vulnerable to friction, so a little extra elbow grease will be the key to removing it from countertops, plastic, or other hard surfaces. Apply acetone to the unwanted glue, then slowly try to peel it off. If the glue doesn’t budge at first, gently use a putty knife or sandpaper to scrape the glue away, remembering that you may need to reapply the acetone a few times before your table or countertop is glue-free again. Apply acetone to a paper towel or cotton swab, then press and hold the material onto the superglue spot for a few minutes—but only after you test the nail polish remover on an inconspicuous section first. If you don’t see any discoloration or damage, then you can apply it to a more noticeable portion of the fabric. Next, scrub the stain with a scrub brush until the glue flakes off; reapply and work in stages as necessary. Finish by rubbing a dollop of laundry detergent into the spot and washing the piece in the laundry to remove any residual glue or acetone. If you get superglue on your skin, first try to carefully peel it off. If that proves unsuccessful, try sanding it off by rubbing sugar or salt on the superglued area. If both methods fail, apply nail polish remover to a paper towel or cotton swab, dab it on your skin, and carefully peel back the glue. Keep in mind that acetone will dry out and defat the skin, so wash the area completely with soap and water, and apply lotion when you’re finished. Superglue sets so quickly, it’s easy to accidentally glue something together despite your best intentions. The best remedy is actually in prevention: Cover your work area with foil before starting, and keep in mind that there are many formulations and applicators available for superglue—including gels and precision tip pens—so try to choose the correct product from the get-go. And, most of all, remember that just a little superglue goes a (very) long way.